Does grilling just seem a little too passive for you? Throw the preformed burger patties on the grill, flip them over in a few minutes, rinse and repeat. Perhaps you like the simplicity. For many men, that is the major selling point of a grill. Ease of use paired with the manliness of an open flame is enough to sell just about any dude on the glory of a grill. 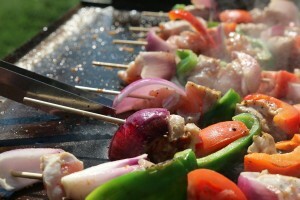 The added fact of delicious grilled meat turns a hobby into a productive pastime. What if I told you there was a far more active and engaging way to grill? Griddle cooking surfaces are now available for the at home grill fanatics. There are many reasons restaurants love to use commercial griddles. First, they are massive and make full use of square foot space. Second, they allow for that extra ‘umph’ from a seasoned cooking surface. And third, they cook quickly and evenly. With all these bonuses, you must think that grilling fien ds would be chomping at the bit for one of these gadgets. I‘ve got to hand it to the Blackstone Company for selling a quality griddle to the masses. We all must have one experience or another with one of those cheap electric griddles from Walmart. Sure, they are kind of cool, but they are ultimately a nicknack. Use it a few times, and then throw it in a cabinet for a year. Eventually it breaks or just becomes too much of a nuisance and is sold at a garage sale. 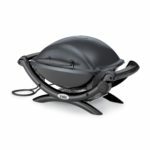 Blackstone delivers with their outdoor griddle by offering a product that actually competes with the commercial griddles. 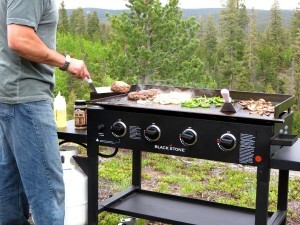 Grilling with the Blackstone Griddle is just a great pleasure. It heats up quickly and evenly. Delivers a great grilled taste to food with that oh so special preseasoned flavor lovers of cast iron cooking rave about. Party guess ‘Ooh’ and ‘Aah’ when they see this bad boy in action. This is just one special grill that meets the needs of a niche audience. Now, with any grill there are pros and cons. The Blackstone Griddle is no different. At this point, you may be saying to yourself that only the pros have been laid out, so what’s the catch? Well, the cleanup and design of this grill in particular can be frustrating. Nonetheless, I will lay out in-detail the biggest pluses and minuses of this grill, and give one final recommendation. Please keep on reading to find out just why I enjoy the Blackstone Griddle so much. Griddle Slate Weighs over 50lbs. Don’t be afraid of buying a grill online, especially this Blackstone Griddle. Assembling this unit should take no more than an hour, even if you only have one pair of hands. The only tool required is a Phillips Screwdriver of a power drill. 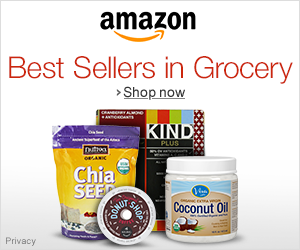 Now, if you are unable to lift fifty pounds and up, you’re going to need help getting everything put together. 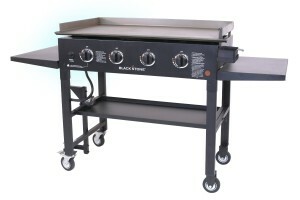 If you can put together a Lego set, then you will have no issue with this Blackstone grill. If you cook with cast iron, then you already know what I’m talking about. If not, a preseasoned cooking surface is inherently non-stick and also delivers a special flavor to any food you happen to cook in it. Think of it as adding a special salty-melty flavor. Honestly, it is hard to describe, but is essentially an accumulation of fat/grease overtime. In order to preseason your grill, I would recommend using shortening upon the first grill cycle. This will supercharge everything, but remember that a preseason coating builds up overtime. The amount of grilling space will shock many out there. Entertain up t o twenty guests without even having to squeeze everything onto this grill extra tight. Personally, I just love that it is possible and even ideal to grill multiple things at once. On one side of the grill, cook up burgers and meat. In the middle make fried brown rice. Cook up veggies on the far left. You’ll wind up with a cornucopia of a feast with this monster grill. When you fire the grill up, I would recommend cooking more food than you’ll need to store as leftovers for the rest of the week. One of my pet peeves when it comes to grills are plastic components and a general wimpiness to the machine. Call it cost savings (I call it cheapness), but nothing will ever beat those good old images of all metal American made grills from decades ago. While I don’t think Blackstone manufactures this griddle in the USA, the griddle definitely meets my love of a metal centered grill. The steel cooking surface alone weighs a ton. Another thing I am happy to throw out are cheap pig iron grates. Here is just one sleek pure body of steel. Just be sure to take care of your machine, it can rust, so be sure to purchase a grill cover. My goodness do folks love to see a griddle in action. Think of those trendy Mongolian restaurants like Benihana. People just are amazed by the sight of food cooking quickly and a flat metal surface. I guarantee you that any party where ten to twenty burgers and veggies are all cooking at once on the Blackstone Griddle will be sure to leave a powerful impression on all guests. Nothing makes me happier when having a BBQ get-together than when the guests naturally gravitate towards the patio to watch the grill in-action. If you hate black gunk buildup on traditional grills, relax knowing that griddles don’t have this problem. To clean this grill, all it takes is water, a scraping tool, and a grill sponge. After you’ve finished cooking, use a spray bottle to wet the grill down after it has cooled down for the most part. Wipe the griddle down with the grill sponge, if anything is sticking use the scraping tool. Paper towels are also a good tool to wipe down the grill. Once everything looks spick-and-span, oil your grill down to make a protective layer. Finally, empty your drip pan and drip bucket (explained in the cons below). Just about any grill has some hassle associated with grease cleanup. Unfortunately, the Blackstone Griddle has serious flaws when it comes to grease management. First off, grease doesn’t drain off from this grill as it should in the perfect world. For some reason Blackstone really dropped the ball in the whole circuit of connecting grease drainage to the drip pan. Here is the quickest and easiest solution, just put a bucket lined with tinfoil under the grill wherever the excess grease drips off. If you’re willing to spend a few extra minutes cleaning after each grilling session, then you’re golden. Griddle cooked food is amazing, a little sacrifice for great results. Cooking with this griddle will require extra tools. Plan on getting aquality grease scraper, griddle spatulas, and a griddle cleaning tool. All these tools can be picked up on Amazon for less than $30 total. Remember, the most important part of owning a griddle is keeping it properly cleaned and seasoned. Use the right tools for the job and you’ll never run into insurmountable trouble. Before you get on my case, just realize that the Presto and Blackstone Griddles are comparing apples to oranges. First off, the Presto Griddle can not be used as a true grill. Most folks like to use their indoor griddles for cooking fun breakfasts like pancakes, eggs, and bacon. Cooking burgers and dogs is definitely a possibility with the Presto, but you’ll sacrifice so much between these two by going with the Presto. Want a Similarly Priced Traditional Gas Grill? Not everyone wants a griddle. For whatever reason if you would prefer a traditional gas grill at the $300 price point, then I would recommend the Char-Broil TRU Infrared 480 Gas Grill. 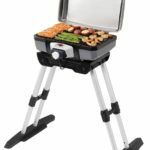 This Char-Broil is not necessary top of the line for gas grills, nonetheless it delivers a solid grill and is attractive looking. Honestly, the grill is boring in comparison to a griddle, but will deliver dependable results. 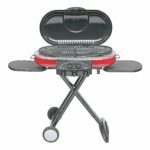 Just Looking for a More Affordable Outdoor Griddle Grill? At almost half the price, the Camp Chef Grill makes for a far more affordable choice. However, you will get what you pay for. Plus, the Camp Chef is dedicated more as a tool for camping, not as a stand-alone grill. With all that said, you’ll still end up receiving a grill with an additional griddle attached to it. Just expect a far smaller griddle space and a less sturdy grill overall. I really do love the Blackstone Gas Grill Griddle. Ever since I was a boy I always thought a griddle would be far more fun to have than just a boring range or grill. Well, here is the most affordable opportunity to get a large sized griddle comparable to any commercial model. While there are issues with grease drainage, I am willing to overlook the inconvenience and rig a solution to the fix. The fun alone of cooking on a griddle is enough to sell me. But all the benefits to entertaining guests, cooking special things like eggs and rice, and the large grilling space makes me just love this machine. Overall, the Blackstone Gas Griddle receives 4.5 stars out of 5. “The top has gotten much smoother and darker. I know, that’s the plan, right? Eggs don’t dare think about sticking.” – Benman A.